The 52nd Annual Big Rock Blue Marlin Tournament is underway in Morehead City this week with 156 boats fishing for a purse of $1,664,450. The 10 year Big Rock record fell on the first day of fishing when the boat ‘Citation’ weighed in a monster 883 pound blue marlin! Day one and the fish to beat had already been caught. 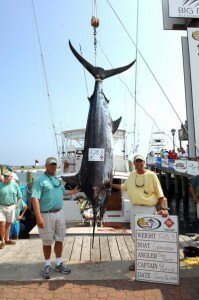 If the fish holds the #1 place all week, the ‘Citation’ will bring home $912,825. Excitement spread all the way up to NYC with our local catch getting a nod from the Today Show hosts. 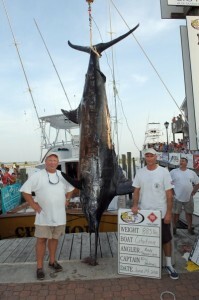 The chase was on when ‘The Carnivore’ weighed in their fat catch on Wednesday, a hefty 529 pounder. And there are more boats are their way to the docks right now to weigh in today’s catch. 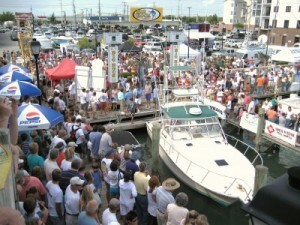 The Morehead City docks are jammed with spectators eager to see the scales once again put to the test.